When you identify a problem with your water or sewer lines, you need to know that you’ve found a professional local plumbing company that you can trust to handle it, no matter what the corrective action may be. Excavation isn’t a simple, minor procedure, and it requires a professional plumber with the best tools and equipment, to get the job done correctly the first time. Don’t trust your water or sewer lines to just anyone; ensure that you are in the very best hands by relying on the expert plumbers at Culler Plumbing Services. Unlike other plumbers in the Metro East Illinois area, we understand that when you have a problem with your water or sewer line, you really can’t wait. That is why we offer same day emergency excavation services. We are here when you need us, and we will never make you wait until regular business hours to get the plumbing help that you need. We know that you take pride in your landscape, and we are happy to say that we can offer trenchless repairs whenever possible. With a trenchless repair, you will get the professional repair that you deserve, without destroying the landscape that you’ve worked so hard for. Keep in mind that trenchless repair is not appropriate in every circumstance, and our experts will work with you to determine which method will work the best for your specific issue. Damage to sewer and water lines can often catch you off guard and leave you wondering how in the world you will pay for repairs. At Culler Plumbing, we truly understand how stressful a situation like this can be, which is why we offer financing for serious and unexpected plumbing repairs. Your pocketbook should never have to be the reason to put off the plumbing repairs that you need! Underground plumbing is a modern convenience that many people don’t think about and take for granted. The web of water and sewer lines that run underground keep plumbing out of site, allowing us to get clean water and carry waste away without having to see it. However, when something goes wrong, underground plumbing can become quite the pain! At Culler Plumbing Services, our expert plumbers provide trenchless pipe repair and excavation services for a variety of reasons. Emergency excavation services are used to for underground water and sewer line repairs. When there are broken underground water lines, costly damage can happen very quickly. Small leaks may take time to notice and are usually observed in your water bill. Others, however, may be more obvious and manifested in soggy ground, overflowing sump pump, damp basements or sidewalks, or some other wet symptoms. There are a variety of pipes that run underground at your home including sewer lines, water plumbing pipes, and gas pipes. To install or repair any of these lines, you will need to use professional excavation services or trenchless pipe repair. 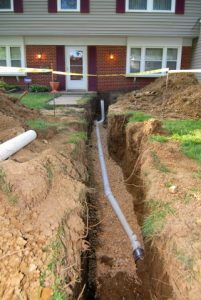 Excavation services will likely be used instead of trenchless repair to install or replace septic systems, main water or sewer lines, or to install new underground plumbing. Trenchless pipe repairs can be a viable option for existing lines with simple breaks. Trenchless pipe repair techniques are not new and can be used to fix a variety of underground plumbing problems. Pipe bursting is the process of pulling a new pipe through the existing pipe and then breaking the old pipe off around the new pipe. Pipelining is the process of patching an existing pipe from the inside or creating a new pipe inside the old pipe. For smaller leaks and breaks, trenchless pipe repair may be an option. At Culler Plumbing Services, our routine or emergency plumbers can inspect and diagnose your underground pipe systems and discuss the best repair options. 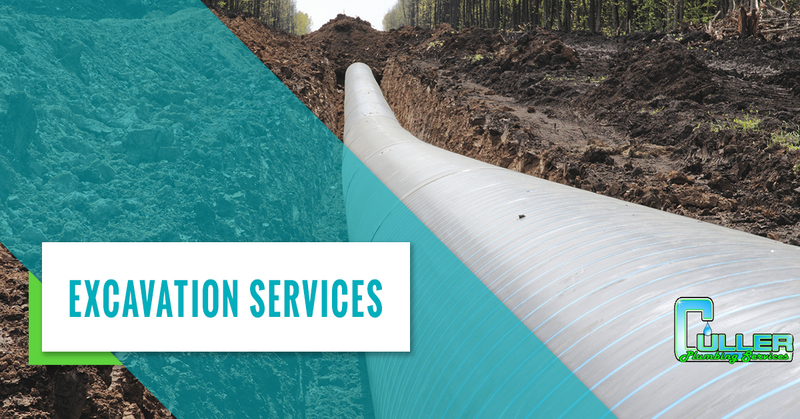 We have the technology and experience to conduct sewer, gas, or water line pipe installation or repair with trenchless options and excavation. For all of your underground line needs, contact us today! Since you cannot see underground water lines, it may take a little longer to identify a leak. If you are concerned that you have a leak, there are a few signs and symptoms you can look for. Or, if you see any of these signs, you should consider that you have an underground water line leak and should call your trusted local plumber right away. Unusual wet spots or pooling water. If you begin to notice any unusual wet spots or pooling water in your landscaping, it warrants investigation. If it has recently rained, it may be difficult to notice these wet spots, but typically rainwater should soak into the ground. When the ground is wet, resulting in pooling, it may be caused by the water leaking up from the inside of the ground rather than a lack of ability of the ground to absorb more water. If you notice an area in your lawn that is soft and greener than the rest of your lawn, it may indicate a smaller underground leak. Here in Metro East Illinois, there are not many boggy or swampy areas, so wet landscape is a fairly sure sign of an underground water line leak. These areas will eventually turn into potholes or sinkholes when the ground gives way. If there is a water line break or leak, you may first notice it inside at the point of water usage. IT may manifest in a house-wide decrease in water pressure or flow volume. You may also hear a cough or sputtering when you turn faucets on. You may also see rust, dirt, or air in the water, it may indicate a break in the line that supplies the water. One of the more subtle indicators of a water line break or leak is a spike in your water bill. Whether your bill has been steadily inclining — small or slow leak — or a sudden dramatic spike, if there is no explanation, it indicates that water is being lost somewhere in the system. Broken water pipes produce a variety of sounds and pipe movement, depending on how big the line break or leak and where the break is located. A hissing sound and pipe vibration can be caused when water pressure is low. Other odd sounds include whooshing, babbling, splashing, or clinking sounds. None of these sounds are normal of healthy plumbing and should warrant investigation. Underground plumbing repairs are difficult to complete without the right equipment and training. However, your local plumber should be able to complete your underground pipe repairs with skilled precision and get the job done right the first time. At Culler Plumbing, we pride ourselves in offering exceptional service in a timely manner. We charge by the job, not by the hour, so you can rest assured that you are getting top-notch service to correct the problem. To correctly identify and diagnose underwater pipe damage, the skilled plumbers will use a variety of techniques. First, a camera inspection (https://www.cullerplumbingservices.com/residential-plumbing/camera-inspections/) will be used to visualize the inside of the pipelines to identify the exact issue. This helps us learn about what the problem is, how big the leak or hole is, and allows us to plan repair options. Some repairs can be made with special equipment inserted into the pipes to repair it from the inside without having to dig up the earth around the pipes — trenchless repairs. Trenchless repairs include breaking up buildup and obstructions, patching punctures, or cleaning and repairing corrosion. If the leak or break is too big or cannot be repaired from the inside, it may be necessary to breach the ground and use excavation techniques. Burst pipes are not common but can happen to underground pipes suddenly due to trauma or can begin slowing and gradually cause a break. Sometimes these pipes burst due to obstructions such as tree roots, ground shifts or earthquakes, or poor insulation that allows the pipes to freeze. None of these situations are ideal and usually require emergency excavation services to quickly expose and repair the pipe to prevent structural damage. The experts at Culler Plumbing Services are well trained and skilled at using the excavation equipment used to dig up the ground around pipes without causing more damage to the lines, with the intent of disrupting as little landscaping as possible. Excavation is an invasive procedure that is only used when there are no other options available. It is a technique that should be done only by professionals, like those at Culler Plumbing. For all of your underground plumbing repair needs, contact experienced plumbers today! What’s Under the Ground at Your House? Burying pipes underneath the ground is one of the most innovative advancements in plumbing and city planning. Hiding lines and pipes under ground not only helps to make modern neighborhoods better looking, but also helps prevent damage to the lines — the packed earth provides protection from weather, breaking, and vandalism. These underground pipelines offer a protected network that is meant to last for decades with little need to expose them. Not much thought is given to this pipe network on a daily basis, but there are many resources flowing beneath your feet. Here, we will discuss a few things flowing under your home. Gas is pumped into your home through underground pipes that help to keep the gas protected in very heavy, tough pipes, and traveling into your home on demand. Keeping gas underground helps to protect your home by reducing the chances that it will be exposed to open flame or high heat. While gas lines are not something that typically makes you think of plumbers, at Culler Plumbing, our skilled professionals are proud to offer gas line installation and repair services. Main water lines carry clean, treated water from municipal water pipes into individual homes. These plumbing lines are the circulatory system for neighborhoods, full of webs of pipes that are alive with flowing water. The biggest threats to underground plumbing systems are tree root growth that can penetrate or break the lines and clot-like obstructions that cause water to find it difficult to pass and may lead to pipe bursts. Much like plumbing lines, sewer lines create a pipe network that carries sewage from individual homes to larger main sewer pipes to your septic tank or the municipal sewage plant to be cleaned. Sewer lines are buried underground for pipe protection but also to prevent people from being exposed to sewage in the event of a leak. Sewer line breaks can be especially dangerous to your family’s health and costly. They should be repaired as quickly as possible to reduce contamination and restore functioning. Irrigation lines, such as sprinkler systems, are buried underground like regular plumbing systems, but are often much smaller and not buried as deep. Irrigation lines are usually on a completely different network than your home’s main water supply and a leak may not be noticed as quickly. Irrigation lines should be blown out with air in the fall, before the first freeze, to prevent frozen pipes and burst pipes. Your local zoning or building office in your municipality may be in order to obtain maps of the complex matrix beneath the ground. Towns will have sewer line and property maps where you can locate your home. They will also have access to utility maps that may help you identify gas and water lines. At Culler Plumbing, we have the state-of-the-art technology and the expert know-how to identify lines underground and repair them. There is a full, complex, pipe system underneath your house flowing to and away from your neighborhood. This system usually requires little intervention and management. However, when there is damage to this underground network, you need local plumbers that you can trust to quickly repair the problem. For all of your underground pipeline repair needs, contact the professionals at Culler Plumbing Services. Regardless of the reason that you are planning or require an excavation, it is never a good idea to just begin digging yourself! Whether you are installing a septic system, replacing old plumbing pipes, or insulating lines, it is important to prepare, use the best equipment, and know what you are doing. With the help of the experts at Culler Plumbing, your excavation project can be completed quickly, with minimal damage, and at the lowest cost possible. We offer financing options so that you can get the necessary work done without worrying. Contact our local plumbing company to schedule your excavation service today.